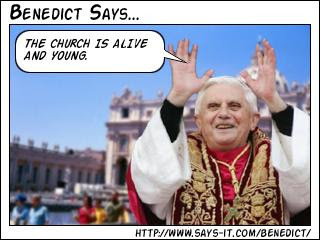 Alive and Young: The Church is "Alive and Young" says the Pope. Nothings beats a plug from the Pope. Clearly someone has been reading my blog. VATICAN CITY, FEB. 16, 2007 (Zenit.org).- The Church is alive and full of youth, Benedict XVI said when presenting a prayer he composed for the young people of Italy. The Holy Father recited his composition Wednesday when meeting in St. Peter's Basilica with bishops of the Marche region in Italy, on the occasion of their five-yearly visit. The prelates were accompanied by pilgrims of the dioceses in the region, many of them young people. When the youths applauded the Pope, he responded: "We see that the Church is alive and young!" Click on the above link to read the prayer. It is very nice.